If you could cherry-pick parts from different models of the same marque, what would you build? 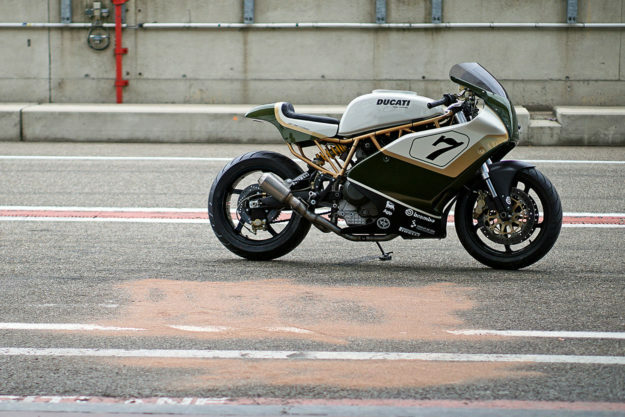 For Kris Reniers of Belgium, the answer is this traffic-stopping Ducati racer. Kris runs Deep Creek Cycleworks, based in the small town of Deepenbeek, near the Dutch border. (You guessed: ‘Deep Creek’ is a loose translation of the town’s name.) 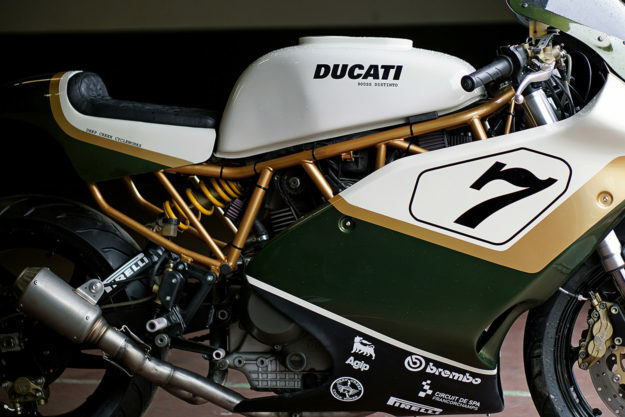 You could technically call his customized Ducati a Frankenbike, bitsa or parts-bin special. But none of those seem fair, when you consider how beautifully coherent it is. Kris handles the mechanical, electrical, fabrication and paint work himself, but calls on his good friend (and Deep Creek race team pilot) Christophe Heyligen to help him conceptualize his projects. 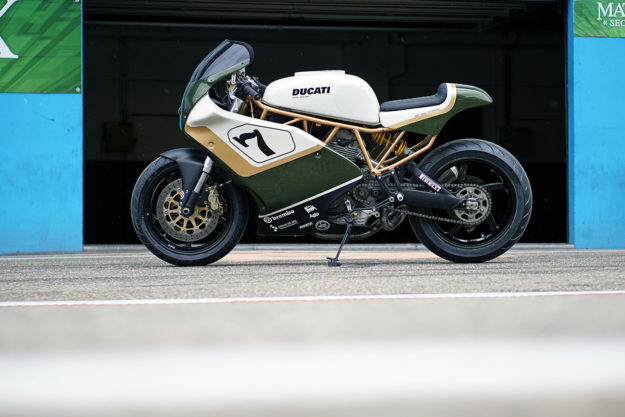 Using the 750SS frame, and the Monster’s engine and electrics, Kris started piecing together his perfect racer from the rest of Ducati’s portfolio. 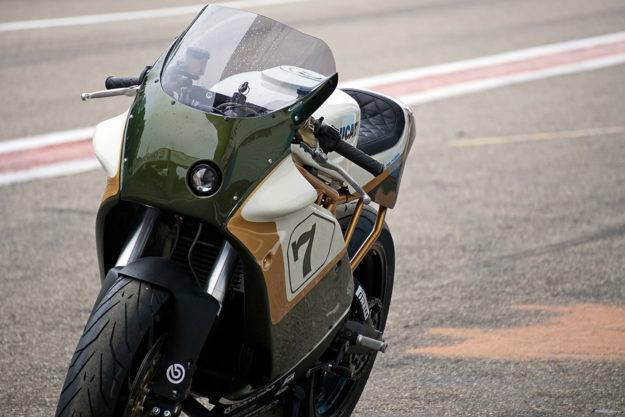 The fairing is a race version of the 1995 model 900SS fairing—so it came without any holes for lights, leaving Kris free to sink a small, off-center headlight into it. 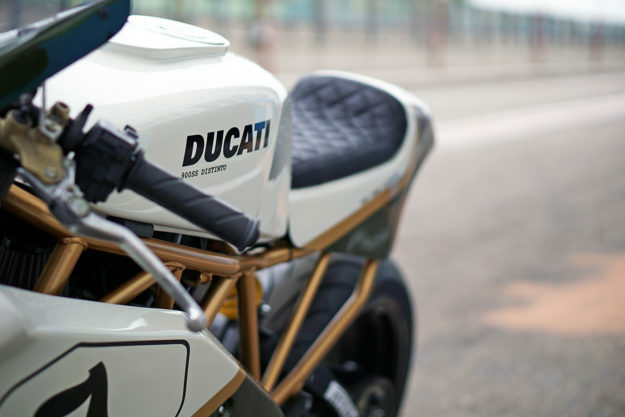 Behind is a fuel tank from a 80s-model 750 Sport. Kris modded it to give it more of an endurance vibe, setting it up so that he can add a dry break fuel system to it later. He also needed to add some extra plumbing for the Monster’s fuel injection system. 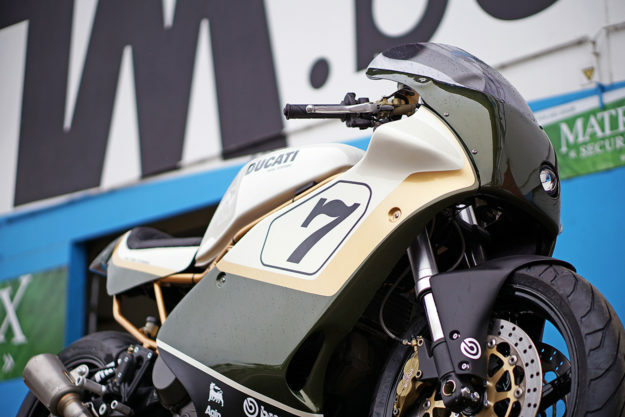 The swingarm’s from a 1000 SS, the front forks and Brembo brakes are from the Monster 900ie with stiffer springs added, and the wheels are borrowed from a Monster ST4. The stainless steel exhaust headers are custom too, and terminate in a stubby muffler. Kris also ditched the airbox and fitted a pair of K&N filters. To finish things off, there’s a Motogadget speedo and a pair of Highsider LED taillight-turn signal combos, mounted to the swingarm. 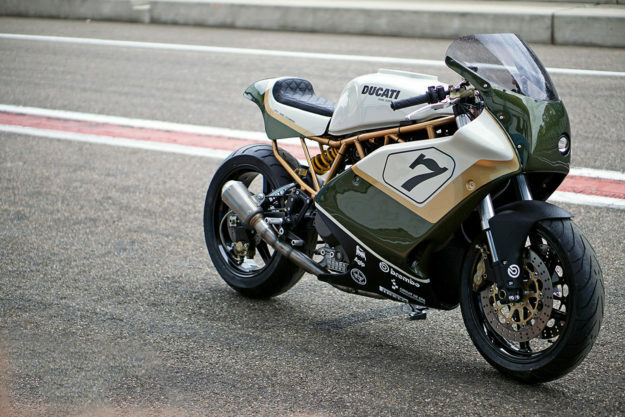 Then there’s that livery—a lustrous white, green and gold combo that’ll turn heads at both the track and cafe. Amazingly, it was applied by Kris himself: There seems to be no end to this man’s talents. 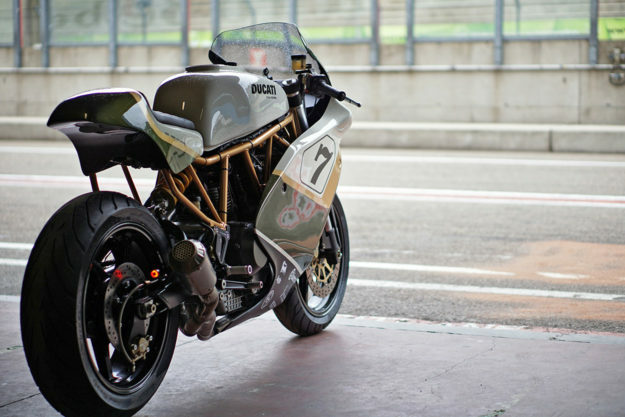 Since Deep Creek are already fielding a Moto Martin-framed, Honda Bol d’Or 1100-powered build in the classic European endurance championship, there’s no need for Distinto to take to the track…just yet. It is street legal though, so for now Kris is content to take it out on the road. And yes, we’re extremely jealous. 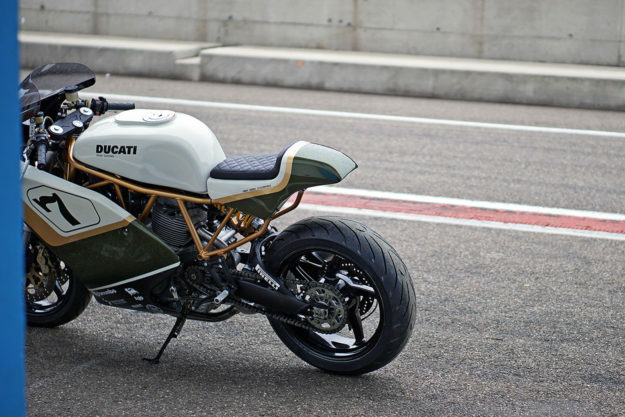 This has got to be one of the best Ducati specials of recent years.